← Brexit.. A wake up call? The engine seemed relaxed at all times, though its sweet spot is clearly between 80 and 100 Kph. No worrying sounds emanated even after running 200+ kms hard at a stretch. Good stance and ergonomics. While a light and buzzy bike tires you with its restless energy, a heavy & heat generating bike tires you just managing it in Indian traffic (inevitable even on long drives). The Himalayan feels just right. Comfy enough for two up riding. In fact the rear preload seemed more tuned to two up riding than solo. Lots of useful info on the dash, if we can get into the habit of actually looking at it. The ugly weld points and general fit and finish. Many bikes report the front external scaffolding or tank being mounted slightly crosswise. The chain guard and saree guard (if u have it on, heaven help you) screws falling off, paint flaking into the tank and blocking fuel lines etc. Tall riders can end up knocking their knees onto the front scaffold. Mine did so (on one side only despite my legs being evenly long afaik :)). At the very least it looks suspiciously like a knee cap breaker in the event of a collision. Doesn’t look like much science has gone into its design beyond weld shop jugglery. The engine vibes significantly after 100 Kph and isn’t really happy in that zone. One could argue that even the Impulse buzzes along happily at 85 kph and that is a 150 cc bike. So how much more are you getting for double the price and engine capacity? The notchy, hard gearing that chews up shoes unless you’re shifting at high revs. Given that the bike requires frequent gear shifts due to it torque curve, this can be a real bug bear. 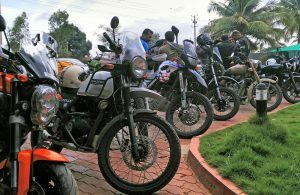 Finally, I find that most folks buying the Himalayan are ex Bullet owners. But I wonder how many of them will really enjoy riding it, because this is a very different animal. Not better or worse, just different! This is not a relaxed, easy going beast that thumps along regally. It’s a free revving, good handling pony that likes to be given a bit of stick. It’s really fun when you shift at high rpms and let that sweet chassis take the twists and road humps at goodish speed. So will the Impulse owner waiting for the KTM adventure, buy the Himalayan and enjoy riding it? That remains to be seen. I personally quite like it, if only they could get those damn gears to slot in neatly. 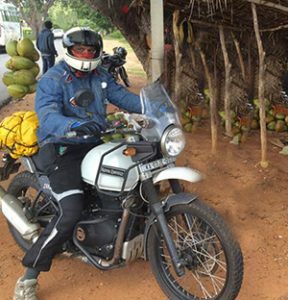 This entry was posted in Travel, Two wheels and an open road, Uncategorized and tagged Himalayan, review, Royal Enfield. Bookmark the permalink.